Today, I’m getting a Ghanaian driver’s licence. Being in possession of a local licence is compulsory for all residents, so after driving illegally in the country for over a year, I figured it was about time to get my house in order. Luckily for me, I just need to convert my foreign licence into a local one. 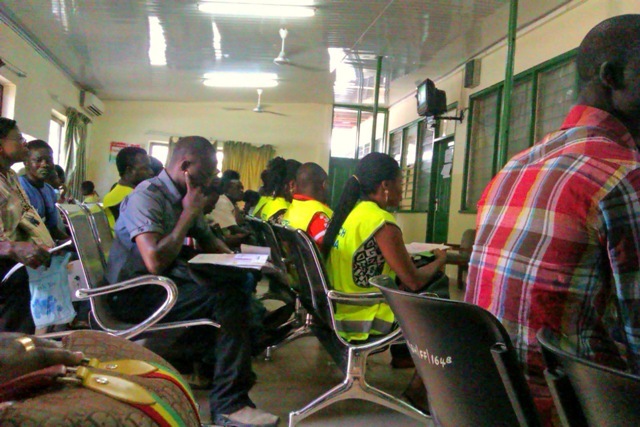 Everyone who has been through the process of buying a car, taking a test, converting or renewing their licence has had to face Ghana’s most dreaded government administration: the Driver and Vehicle Licencing Authority (DVLA). It is infamous for its painfully slow procedures, its ability to lose files and mysteriously recover them in return for small benefits. Many have tried and failed, sometimes losing patience after 5 hours of waiting, or coming back many times because they were told they had filled in the “wrong form”. 09:10: arrive at the DVLA office. The waiting game begins. 09:40: the regional manager wants to see me before approving my application. While I sit in his office, he takes on four phone calls and places one: “Good morning, Sir. How is your health? And the family? Thank God. I just wanted to hear how you are. OK, we’ll talk later”. Then he stands up, points a stick at a poster on the wall and sternly, like an old school teacher, gives me a test on regulatory signs. Satisfied that I know the difference between “no parking” and “no overtaking”, he signs my form. 09:55: back in the waiting room. There is constant movement and creaking of chairs, as candidates for the driving test “move up” the waiting list by swapping seats with the person in front of them. A police officer in uniform tries to sneak in the front row, as he’s spotted an opening with a lady who’s a bit slow on the move. He is immediately admonished by 20 people behind him who are waiting to enter the holy sanctuary and he swiftly leaves the room. Meanwhile, Nigeria’s X-Factor is playing on TV. A woman has impressed the judges by making a can of beer stand upright on her buttocks. The audience is in hysterics and she goes on to the next level. Back in the room, a few women have sensed a business opportunity and are selling bagels and cold drinks. They seem to be making good money. 10:50: the wait goes on. An officer tells me that one of the forms in my application has been misplaced and they are searching the archive bags for it. I go back to reading my book, while the Mexican soap “Dueña” is playing on TV. 11:45: my “driving competence form” is officially declared lost by an incompetent officer, and I’m forced to fill in a new one. I must produce 2 passport photos, which I don’t have on me, so I go back to the main gate where about half a dozen men rush towards me, asking “hey lady, you need pictcha?”. I sit in a plastic chair, while one of them presses his digital camera in my face. Ten minutes later, I hand over my form and my photos. 12:03: the competence manager has locked himself in his office and won’t sign my competence form until his lunch break is over. I seriously contemplate conceding defeat, but settle for the bagel lady instead. 12:40: the competence manager’s door opens and I spring into action. Then I bring my form to the fingerprints and photo lady in the next room. She is in a good mood and is delighted to speak French to me as she reads out my name. In just a few clicks she enters my data, takes my picture and lo and behold, the digital printer issues a copy of my brand new Ghanaian licence! 12:50: mission accomplished. I’m out. Wait a minute: I look at the small print at the bottom of my licence and it says “temporary – valid for 3 months only”. I guess I’ll be back by Christmas. Categories: Ex-pat living, Humour, Uncategorized | Tags: Driver's license, DVLA, Ghana | Permalink.